At just $30, the AUKEY Latitude Wireless Headphones are Aukey’s most popular Bluetooth earbuds and it’s not exactly a mystery why. They feature great sound quality, three different built-in EQ modes, 8-hour battery life, and a comfortable design that completely eliminates fatigue even after hours of listening. They’re indeed a bargain at $30, but you’re in for a treat today. 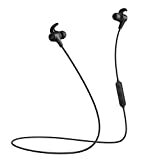 Use the coupon code WCITQDNR at checkout on Amazon and you’ll get these terrific Bluetooth buds for just $17.99. That’s an all-time low, and you only have two days to take advantage.